'Oblivion' Director Talks Cruise, Sci-Fi | Radical Studios, Inc.Radical Studios, Inc.
UNIVERSAL CITY, Calif. — Joe Kosinski, director of the Tom Cruise sci-fi adventure Oblivion, has no qualms with the recent, digital-first home entertainment release strategy studios have been employing. Like so many other big box office ($286 million worldwide) releases, Oblivion was out on digital from Universal Studios Home Entertainment July 23, two weeks before the Aug. 6 disc releases. “Personally, for me, Blu-ray is the ultimate way to see this film,” he said during a recent press event for Oblivion. “We’ve encoded the Blu-ray for this movie at over 30 megabytes, the video track, the highest-quality video you can fit on a Blu-ray. We have the lossless DTS master soundtrack. We have an incredible, 96-kilohertz, soundtrack-only of the movie. With disc, Universal hands owners a slew of otherwise-unobtainable bonuses, including a commentary with Cruise and Kosinski, deleted scenes and a multi-part, making-of feature, one that offers Blu-ray owners exclusive content. Eric Barba, visual effects supervisor for the film, said the bonus features give Blu-ray owners true insight into the amount of work that went into the visual effects — live and CGI — for Oblivion. “This was challenging in that Joe wanted to shoot so much of this live, that out job was to integrate everything as seamlessly as possible,” he said. 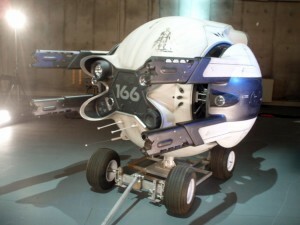 Daniel Simon, the concept designer behind Oblivion’s “Bubble Ship” — which earns nearly as much screen time as Cruise himself — said nearly three years of work went into the prop, from sketches to functional, full-size prototype. The creation of the Bubble Ship earns its own Blu-ray-exclusive bonus feature with the featurette “Voyage.” Blu-ray owners also get the exclusive featurette “Combat,” which delves into the stunts of the film. Yet for all the attention paid to action and eye candy in the bonuses, Kosinski is still hopeful disc owners check out that oldie but goodie: the commentary. This movie promoted my questions about the future what kind of unknown things could be happen suddenly and how we are unprepared. But also this movie and the way that Mr. Cruise inspired me to create new stories and novels based on this ideas. I have 8 years old and I am brazilian, and I believe that in the future I could have opportunity to descovery how Oblivion was produced and fell how strong and exciting it will be. Many thanks to Mr.Cruise and Mr.kosinsk. Pedro A.